Elizabeth Farm, Parramatta, built in 1793, the oldest surviving house in Australia. Since 2007, Ted Higginbotham has been on the trail of the Macarthur Family, not only at Elizabeth Farm, Parramatta, but also at Belgenny Farm on the Camden Park Estate. Ted has undertaken a number of excavations for the Historic Houses Trust at Elizabeth Farm, in 1984, 1985, 1991 and more recently in 2007 (see Reports). The excavations in 2007 were intended to determine the cause of the instability of the footings between the Drawing Room and Main Bedroom of the building constructed in 1793, the earliest surviving house in Australia. In spite of the small scale of the excavation, it soon became apparent that the archaeological and physical evidence was telling us a different story about the building of the house. This led to an investigation of the sequence of building as revealed by a series of mortar samples, now confirmed by both historical and structural evidence. The result was a seminar, delivered to Historic Houses Trust staff in early 2008 and an article in Insites, the magazine of the HHT. This small scale project illustrates the importance of undertaking detailed analysis of historical buildings, preferably before restoration covers up or destroys the evidence. Archaeologists have a significant role in this type of study, because of their training and expertise in the dating of building materials. The evidence revealed that the Main Bedroom and the original roof is the oldest surviving part of the structure, built in 1793. The Dining Room, Hall and Drawing Room were substantially rebuilt in 1826, together with the other extensions. My thanks go to the Historic Houses Trust for permission to undertake this study and to the curatorial staff, together with Mr. Alan Croker, Design 5 Architects, for encouragement throughout the project (see Links page). And, yes, we did find out why the walls are cracking. The 1793 building was constructed with deep footings, while the 1826 extension walls simply rested on clay subsoil, so allowing for substantial movement between the different walls. You can download a copy of the Insites article, which first appeared in Insites, the Magazine of the Historic House Trust, Winter 2008, Issue 55, pages 8-9. Plan of Elizabeth Farm, showing the sequence of building revealed by mortar sampling. 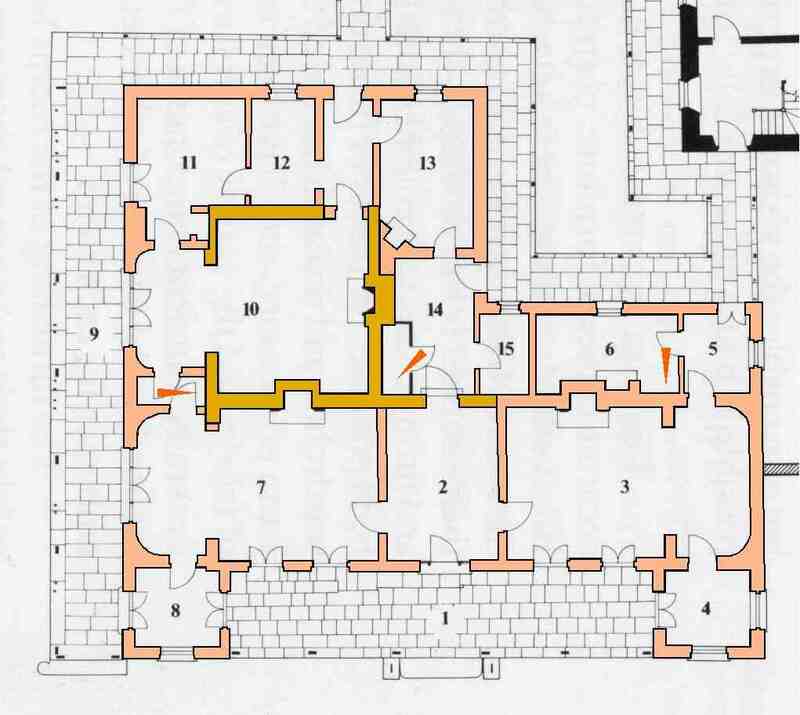 The Main Bedroom (Room 10) and the back wall of the Hall (Room 2) are all that remains of the original building, except for the roof. The remaining rooms were largely rebuilt in 1826 (pink) (Base plan, Historic Houses Trust).